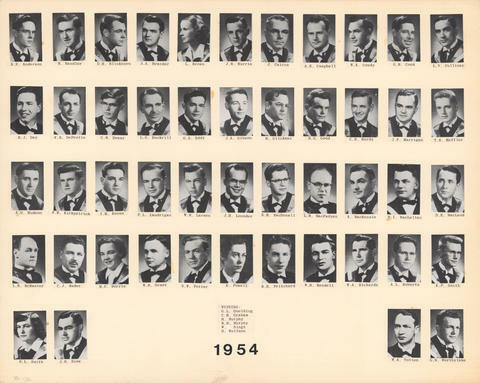 File is a composite photograph of the Dalhousie Faculty of Medicine Class of 1954. 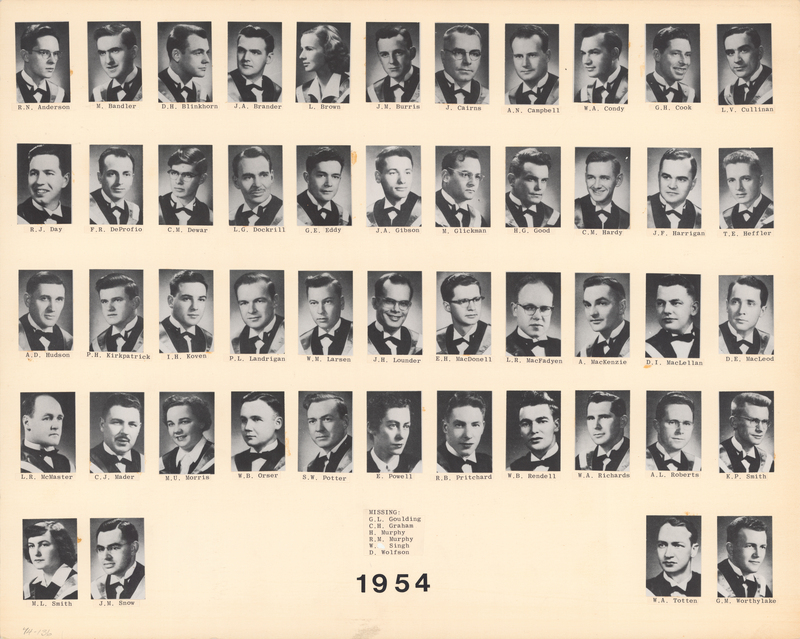 Composite includes 48 individual portraits. Individuals identified on the sheet are as follows: R.N. Anderson; M. Bandler; D.H. Blinkhorn; J.A. Brander; L. Brown; J.M. Burris; J. Cairns; A.N. Campbell; W.A. Condy; G.H. Cook; L.V. Cullinan; R.J. Day; F.R. DeProfio; C.M. Dewar; L.G. Dockrill; G.E. Eddy; J.A. Gibson; M. Glickman; H.G. Good; C.M. Hardy; J.F. Harrigan; T.E. Heffler; A.D. Hudson; P.H. Kirkpatrick; I.H. Koven; P.L. Landrigan; W.M. Larsen; J.H. Lounder; E.H. MacDonell; L.R. MacFadyen; A. MacKenzie; D.I. MacLellan; D.E. MacLeod; L.R. McMaster; C.J. Mader; M.U. Morris; W.B.Orser; S.W. Potter; E. Powell; R.B. Pritchard; W.B. Rendell; W.A. Richards; A.L. Roberts; K.P. Smith; M.L. Smith; J.M. Snow; W.A. Totten; G.M. Worthylake. Composite photograph is mounted on cardstock with second composite on verso (PC1, Box 23, Folder 23, Item 2). Description created by Sophie Boucher on December 11, 2017.